OX YOKE ORIGINALS WONDER PATCHES, .020"
Ox Yoke Originals Wonder Patches are top quality pre-cut shooting patches of 100% cotton fabric woven to strict uniform specifications then treated with Wonder Lube 1000 Plus, a unique lube that virtually eliminates wiping between shots and makes clean-up easier. .020" thick, bag of 100. Available in four sizes. .30-.39 cal. No. 333205, .40-.49 cal. No. 334205, .50-.59 cal. No. 335205, .60-.69 cal. No. 336205. 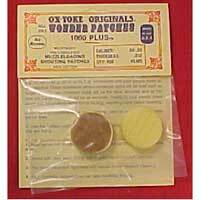 Tag: OX YOKE ORIGINALS WONDER PATCHES, .020"